and this was tailored for MGE, so no city is worth more then one point. have a full tech tree to explore, and any unbuilt wonders to acquire. unit with 2 space viewing and good attack values, but weak in defense. Yes, the game is very fluid, with so many horse soldiers about, as well as roads and rivers, things move rather quickly. scenario would be ideal for multi-player. in Spain and Africa, and can be a shock to the unprepared. Yes, the sounds are all tailored to the units, and blend in nicely. his huns are a nice bunch of marauders lurking about. building and research, I’ll go for only 0.5 here. All the units are changed from civ-2 default units. wall unit, but all work within the context of the scenario. All units capabilities are pretty standard here, nothing jumps up as unique. This whole scenario is about barbarians! But there are also random AI Barbarians in addition to the tribal types. No problems here, all works just fine. There is little to research, and nothing really goes obsolete, but for the time frame depicted, it works well. 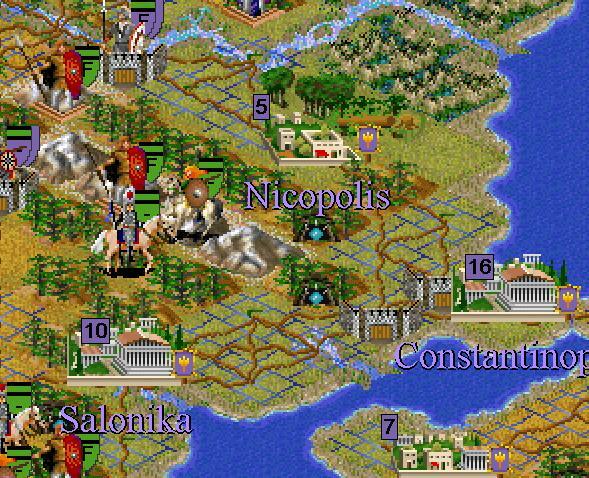 It is satisfactory for this game, and slightly different for only the Eastern Romans. All messages fit the atmosphere of the scenario. All units, civic improvements and wonders are properly explained. All worked as it should, the game functions smoothly. Yes, the map includes most of Europe, North Africa, as well as the Russian steppes and Persia. 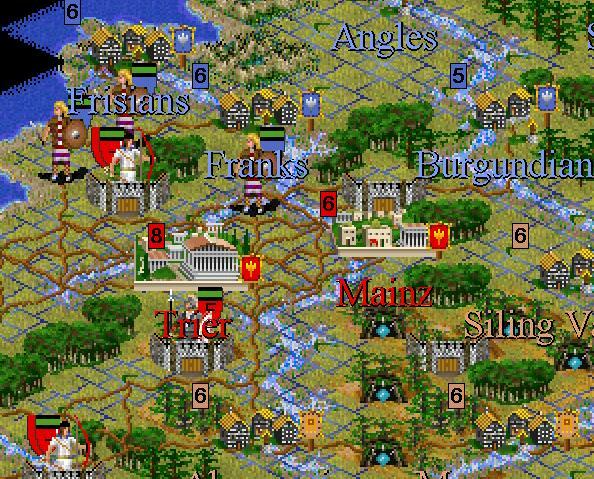 The cities chosen were logical and well placed, with minor barbarians named as cities in the barbarian zones, a nice touch. The terrain is correct for the period depicted, all these areas played a part in this story. Yes, there are no poorly placed or historically inaccurate cities. As stated earlier, all cities are correct for this period, and good selections were made for each one. very fluid and dangerous to attack. wonders are examined, but little historical commentary is included. Events were used to trigger major barbarian invasions, random Barbarians and some naval units for city capture. All fit the time period and are pleasing to the eye. None come to mind, but there may have been some, but all sounds match the units correctly, but leaders lack sound. All the units here were created for this scenario, and are quite beautiful, it’s the real strength of this scenario. in a more enjoyable way. This scenario is fun to play. No, the events were used to fit the theme, barbarian invasions and reinforcements and such. A few small things could have been modified, but are hardly important, it works as intended. author, it’s highly recommended for those who love the sting of battle.